Calgary will be a battle ground for the next provincial election as the city faces dark times with the decline of the oil industry in Alberta. Rod Frank points to a mostly unremarkable assembly of steel pipes running through the heart of a snow-covered industrial playing field, amid rows of huge white oil storage tanks. The “it” to which he refers is a pipeline – the Trans Mountain pipeline expansion, to be more precise. But in Alberta it’s simply known as the pipeline. As in: They need to get that damn pipeline built. Amid the tangle of shiny grey pipes is the start of the original Trans Mountain line that runs across the province, then winds its way through the middle of British Columbia to a coastal terminal in the Vancouver suburb of Burnaby. For anyone wishing to tap into the prevailing mood of Alberta amid the current provincial election campaign, this is as good a place as any to start. Rightly or wrongly, the pipeline, or rather, the lack of a new one, has become a symbol of all that angers the populace and fuels an almost tangible resentment that is likely to lead to a regime change after the April 16 vote. That sense of grievance was palpable in the voices of people I spoke to as I travelled the province recently in an effort to better understand the origins of the alienation and how deeply it runs. It was also a journey intended to determine how much of the anxiety is rooted in a struggle to come to terms with global developments in the energy industry that portend an uncertain future. Strathcona County Mayor Rod Frank in refinery row in Sherwood Park, Alta., on March 13, 2019. An economy battered into recession by the shocking drop in the price of oil in 2014 and 2015 is by far the paramount issue on the minds of voters. Even though there are signs the worst may be over – more Albertans are working today than at the start of the recession in October, 2014, and women are employed at near-record levels – there is still enough bad news around to convince people the province remains in trouble. For instance, the job picture for young men – the demographic hardest hit by the massive job-shedding that took place – remains bleak. After emerging from recession in the fall of 2016, and seeing solid growth throughout most of the following year, economists worry Alberta is now stagnant again. Provincial debt is on track to hit $100-billion within a few years – roughly five times what it was when Premier Rachel Notley’s NDP government took office in 2015. Her administration has been using a government credit card to pay for the groceries. To some extent, all these problems lead back here, to Refinery Row, where thick crude from the oil sands arrives for distribution and export. 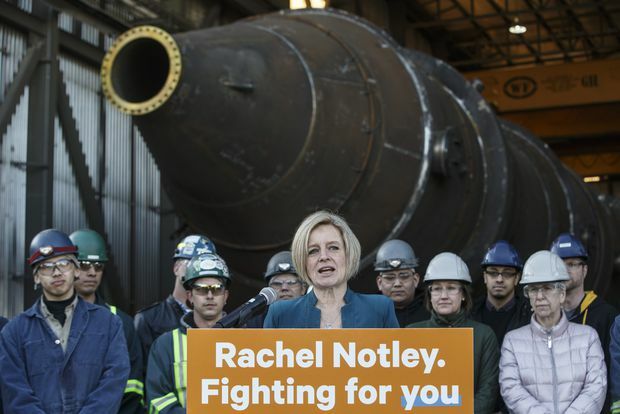 This is where Ms. Notley hoped to have the ultimate, pre-election photo op – with her hard hat on and shovel in hand, delivering a speech commemorating the beginning of construction on the Trans Mountain expansion. It didn’t work out that way. Owner Kinder Morgan bailed on the project last year after a setback in the courts, prompting the federal government to take it over. No one knows for sure when, or even if, it will ever get built. The Alberta election seems destined to not just fundamentally alter the political dynamics of a province but a country as well. That is why it is being as keenly observed in Ottawa as it is in Okotoks. Imagine the ramifications of the most likely outcome at the moment: a victory for Jason Kenney and the United Conservative Party (UCP) – also known as Prime Minister Justin Trudeau’s worst nightmare. The UCP has been cruising along at above 50 per cent in the polls since the January, compared with about 35 per cent for the NDP. Mr. Kenney’s loathing for all things liberal is well known and well documented. Among them are provincial and federal carbon taxes aimed at consumers. If elected, he’s vowed to not just get rid of the carbon levy Ms. Notley introduced in 2017, but to fight the federal backstop that would then be levied in its absence. Alberta UCP Leader Jason Kenney makes an announcement on March 28, 2019. I’d be surprised if anything less than 99.9 per cent of Albertans answered “No” to the first question and “Yes” to the second, so programmed have they become to believe equalization favours Quebec at their expense. That the provinces have virtually zero control or say over equalization seems irrelevant. Mr. Kenney is stumping on the issue because it plays well on the campaign trail. So does bashing Mr. Trudeau, which he rarely needs an obvious opening to do. The UCP leader has also sounded the war drums against British Columbia and the efforts of its NDP government to stop the Trans Mountain pipeline expansion. If B.C. persists, Mr. Kenney vows to take unprecedented retaliatory action, including economic blockades, if necessary. Right now, Albertans can’t get enough of that kind of tough talk. If Mr. Kenney’s party gets in, there will be a formidable conservative bloc of governments from Ontario to Alberta, and he would likely become its leading spokesman. If Andrew Scheer were to lead the Conservative party to victory in October’s federal election, Mr. Kenney would have a formidable ally in the nation’s capital to usher in an agenda of change that has profound implications for the country. When you come to think of it, there probably hasn’t been a more consequential vote in Alberta since the 1993 election, which ushered in the Ralph Klein era. Mr. Kenney could be a modern-day version of the iconic former Alberta leader. Twenty minutes to the south of Strathcona County is another Strathcona: the old Edmonton neighbourhood that represents the beating heart of NDP support in the province. The riding of Edmonton-Strathcona is represented by none other than the party leader herself, Rachel Notley. This is a government town. Many people here owe their livelihood to the province, and many are thankful that Ms. Notley has resisted the voices urging her to slash civil service jobs to mitigate Alberta’s escalating debt problems. Alberta NDP Leader Rachel Notley makes a campaign stop in Edmonton on March 20, 2019. In the progressive bastion of Strathcona, Ms. Notley is still much beloved. After defeating the Progressive Conservatives to become Premier in May, 2015, she forged ahead with an ambitious leftist reform agenda despite the continuing decline in the price of oil. The NDP did away with Mr. Klein’s flat income tax, raised taxes on the wealthy and corporations, and boosted social spending. On the environment, Ms. Notley set limits for oil sands emissions and introduced her carbon levy. She also increased the minimum wage in stages, from $10.20 an hour in 2015 to $15 last year. Just about her only major deviation from the left is her battle for new pipelines. Mark Wilson, who owns a shop in Strathcona called Vivid Print, thinks the UCP will win the April election. But he also knows that unexpected developments in previous campaigns – including 2015 – altered anticipated outcomes. Down the street, Juanita Roos is perusing the stacks of wine at her store, Color de Vino. Ms. Notley herself occasionally drops in to pick up a bottle of red. Like many voters in the area, Ms. Roos is a Notley believer. Gert Raynar of the Leduc & District Food Bank. A half-hour drive south of the city, Gert Raynar sits behind a desk in a cramped office at the Leduc & District Food Bank. It is a thriving operation that has recently taken over a 10,000-square-foot space – a desperately needed upgrade from the building the non-profit used to inhabit, which was a fraction of the size. There are racks upon racks of non-perishable food – cans of soup, boxes of Kraft Dinner, jars of peanut butter, dry noodles – that stretch from floor to ceiling. There’s also a massive walk-in freezer. One thing is a constant: demand. Their career prospects are bleak. “The oil companies aren’t doing a lot of hiring right now, and what little they do usually goes to young men who are cheaper,” Ms. Raynar says. Leduc, of course, played a vital role in the history of Alberta. On a farm near here in 1947, riggers working for Imperial Oil tapped into a rich deposit of crude that changed the economic course of the province forever. The gusher at Leduc No. 1, as the well would be named, provided the geological secret that unearthed access to the province’s abundant conventional oil reserves. But to the people who are visiting Ms. Raynar’s food bank today, that history is meaningless. She sees similarities between the demand for assistance now and the need that existed during the oil recession of the 1980s. Erna Carter sits on a sofa across from Ms. Raynar, nodding in agreement. Ms. Carter is the executive director of Riseup, a counselling service for people affected by domestic violence and abuse. There is a direct correlation between any downturn in the economy and the demand for the services her non-profit offers. What trickles down in an economy like this is stress. When household finances decline, domestic violence goes up. It’s a vicious cycle: more separations, more divorce and more women and their children moving out on their own and dependent on income support. Both women are worried about the election, and what might happen if Mr. Kenney wins and starts slashing government social programs to trim spending. “There is a huge concern among social-service agencies about the outcome,” Ms. Raynar says. “These last four years is the first time a lot of these organizations had really solid, meaningful backing from a government. The key question voters often ask themselves is: Am I better off today than I was when the current government took over? It is always a very personal assessment, and highly subjective. The decision can often defy the broad economic markers that offer a more complete story. Trevor Tombe, an economist at the University of Calgary, has emerged in the past few years as a bit of a provincial truth-teller, unafraid to challenge prevailing orthodoxies or popular political storylines: The Alberta carbon tax is hurting those who can least afford it! A sales tax would kill the economy! A return to good times isn’t far off! To each of those suggestions, Mr. Tombe would say no, no and no. Seated in a leather chair in a coffee shop on the ground floor of the downtown campus of the university’s school of public policy, Mr. Tombe is busy marking papers. “It’s that time of year,” he says. It’s also election time, and his perspective on a range of campaign-related questions is insightful. Perhaps the biggest is: How is Alberta really doing? The province pulled out of its oil recession in 2017 to lead the country in economic growth, but it stalled in 2018. Mr. Tombe is unsure what 2019 will bring, but the early indicators aren’t good. The December jobs report was very negative. The January jobs report was equally so. February was flat. It’s possible the province could be in the early stages of a second recession, he says. Job activity numbers that came out this past week showed some improvement, but economic growth still seems to be at a standstill. Those grim reports have a psychological impact on people, even if they’re still employed. Any discussion about an economy in peril breeds feelings of doubt and apprehension. Those could certainly influence a voter’s choice; or confirm it. Alberta’s seasonally adjusted unemployment rate in February was 7.3 per cent, not a lot higher than the national average of 5.8 per cent. But some segments of the province’s labour market have suffered much more than others. When the recession began in October, 2014, 67 per cent of men aged 15 to 24 had a job, according to provincial and federal statistics. By 2016, it was down to 60 per cent. Today, it hovers somewhere near 55 per cent. What does that percentage drop-off mean in terms of numbers? There are 39,000 fewer men in that age bracket working today than there were in October, 2014. The province’s unemployment rate for men who completed just a high school diploma was 14 per cent, last year, and 23 per cent for those who didn’t get that far. Polls show that the public believes the UCP is best suited to handle issues related to the economy, eclipsing the NDP by a more than two-to-one margin. In a perverse way, economic bad news is good news for Jason Kenney – at least in the short term. And let’s face it, that’s where Mr. Kenney’s attention is focused now anyway. But the numbers that consume Mr. Tombe at the moment relate to the trouble awaiting Alberta down the road. Royalty revenues from the oil industry are expected to continue to slow. There is growing pressure globally to decarbonize economies. While Alberta has a young population now, it will continue to age, dramatically driving up health-care costs. Alberta still has no provincial sales tax, but he suggests it would take a levy of 10 per cent to close the revenue gap he believes is coming. To close the same chasm on the expenditure side would mean eliminating $1 of every $6 the government currently spends. In other words, there is a much more serious fiscal challenge ahead, one Mr. Tombe says politicians should be preparing people for now. The economist projects deficits of $40-billion by 2040 unless drastic action is taken. It would run the province’s debt-to-GDP ratio – now at just under 7 per cent – to about 50 per cent. There are no painless remedies. Richard White is getting ready to leave Calgary for a month in Vancouver. But the noted urbanist and former city planner is pretty sure what the campaign narrative will be while he’s gone. Mr. White is right about the political spin. In recent days, leaders campaigning around the themes of jobs and the economy have used Calgary’s downtown oil and gas towers as a backdrop for their announcements. The vast swaths of empty office space in them are intended to symbolize the seriousness of the province’s woes. Any oil downturn hurts this city more than other parts of the province. When petroleum prices started to slide in 2014, energy companies laid off thousands of employees. ‘Termination Tuesdays’ became a thing. At the end of 2014, the vacancy rate in the downtown towers was about 10 per cent. Last year, it was nearly 28 per cent. But as Mr. White and other experts argue, the unbridled optimism that buoyed the city in the early part of the decade incited the construction of five million square feet of office space that really wasn’t needed. If you subtract that space, you’re left with a 10 to 15 per cent vacancy rate that isn’t that uncommon in big cities. The NDP made huge gains in Calgary in the 2015 election. This time around, the UCP is expected to claim much of that old conservative territory back. But Mr. White says it could be closer than people think. He argues that the pessimism one hears so much about, the darkness that is said to be running through the city, is overstated. Janet Brown, the noted provincial pollster and pulse-taker, has lived in Calgary for 19 years. She feels a deep despair in Alberta, despite the fact its economic fundamentals remain better than many provinces. She says she doesn’t think the government has done a good job at easing angst and uncertainty. Clarence Shields, owner of Blackjacks Roadhouse Games Room, speaks with customers on March 11, 2019. The first thing that greets you when you walk through the doors of Blackjacks Roadhouse Games Room in the town of Nisku, near Edmonton, is an old gasoline pump that might have been used at filling stations 90 years ago. Above it, there is a placard adorned with a Canadian flag that reads, “I love oil and gas.” Nearby is a large black-and-white framed photo of Leduc No. 1, Alberta’s first big gusher. The bar is near the intersection of two of the busiest highways in the country, with more than 110,000 vehicles passing by each day, and it is huge – more than 20,000 square feet. Just about every square inch is used to display some piece of memorabilia related to the oil industry, including a top fuel dragster and a funny car that hang from the ceiling. Talking to Mr. Shields is like talking to a lot of Albertans. His wrath isn’t so much directed at Rachel Notley or the NDP, but “the gang in Ottawa” that is “out of touch” with the rest of the country. When he looks east he is blinded by an anger stirred by what he sees is blatant favouritism toward Quebec. But Mr. Shields is not happy with Ms. Notley’s NDP, either, despite her push for pipelines. He’s against many of her other policies, including the carbon tax, the raises to the minimum wage, higher corporate taxes and contentious farm-safety legislation. It doesn’t help that the NDP Leader also cozied up to Mr. Trudeau to keep Trans Mountain alive. “Like that did her a whole lot of good,” he says. When Mr. Shields found out that Conservative Leader Andrew Scheer was going to be in the area recently, he put a call out to his trucker friends urging them to show up and register their anger over what’s going on with the energy industry. It was a Wednesday night. He said more than 2,000 rigs turned out in what he claims is the longest convoy in Canadian history. Including himself. Recently, Mr. Shields opened the first legal recreational cannabis store in the area – Northern Lights Supply. He said he was forced to diversify because the saloon business isn’t what it used to be. He thinks that unless the province gets another pipeline soon, more and more people who were once in the energy business are going to have to start looking for other lines of work. Sarah Hamilton takes a seat in a booth at the Oil Lamp, a Greek restaurant near Edmonton City Hall. Ms. Hamilton is a progressive-minded first-term alderwoman who many believe is destined for greater things in Alberta politics. She absolutely destroyed the competition in her ward race in 2017. The 32-year-old has a veteran pol’s instincts for what is going on in the mind of the public, especially middle-class families who form arguably the most crucial block of voters come election time. She says that many of Alberta’s problems are not of Ms. Notley’s doing, but in many ways it doesn’t matter. “If people think you’re responsible, or have become convinced that it’s true, that will tell you the story of the election,” Ms. Hamilton says. Ms. Hamilton says Ms. Notley’s personal brand is very high, far exceeding her party’s. It’s the opposite with Jason Kenney and the UCP – his party is more popular than he is. “Election watchers can usually tell you where things are going on likeability factor alone,” Ms. Hamilton says.